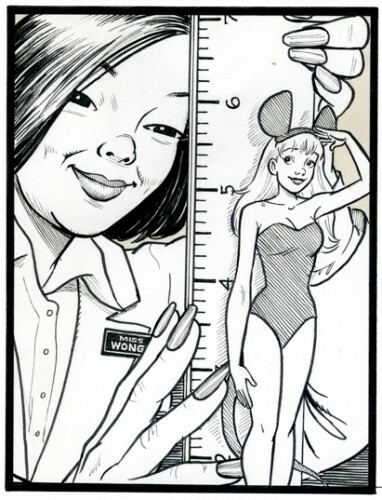 Little Betsy gets measured as a Mousegirl. A Shrinking Women story illustrated by Bojay! Betsy, an actress and dancer, is hired to be the new Mouseburger Mouse Girl. She is reduced in size and put in a burger box to announce the winner of the big Mouseburger prize. What could go wrong? This was my first shrinking story and is still one of my favorite scenarios. It’s great to see the story come to life through Bojay’s artwork. This entry was posted in All Comics, All Giantess and Shrinking, Bojay, Free Comics, Shrinking Women and tagged Shrinking Women on March 8, 2011 by dreamtales.